PARIS — The Airbus A321-200 had just reached a cruising altitude of about 33,000 feet when, around 20 minutes after taking off from the Egyptian resort town of Sharm el-Sheikh, it suddenly plummeted by some 6,000 feet. Over the next 20 seconds, the airliner, which was en route to St. Petersburg, Russia, abruptly climbed and descended several times before radar contact was lost, according to preliminary transponder data published by FlightRadar24.com, a commercial company that tracks airline routes. Investigators were weighing that chain of events, and other factors, as they undertook an inquiry into what caused the 18-year-old aircraft to fall from the skies above the Sinai Peninsula on Saturday, killing all 224 people aboard. But unravelling exactly what led to the disaster could take weeks, aviation safety experts said. The list of potential explanations includes a number of possibilities, ranging from a sudden mechanical or structural failure to a more troubling scenario, like a terrorist attack. 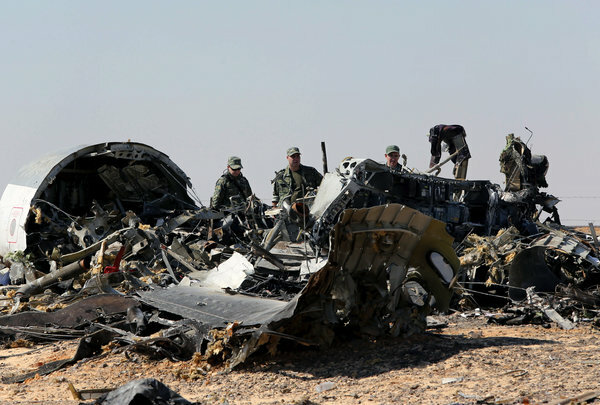 On Sunday, officials cited the exceptionally wide distribution of debris, over an area of approximately 20 square kilometers, or 7.7 square miles, as a strong indication that Metrojet Flight 9268 did not hit the ground intact. 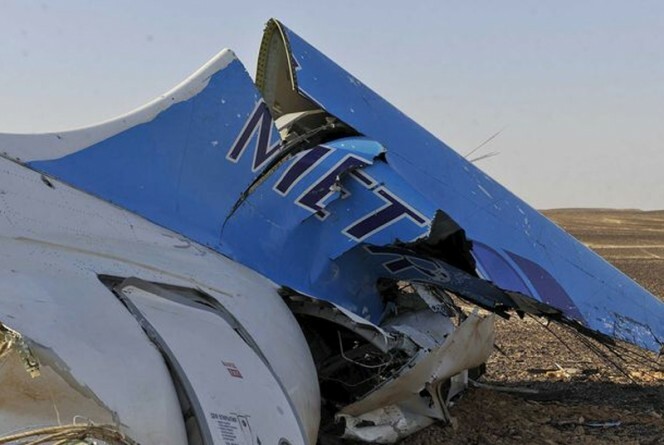 “Disintegration of the fuselage took place in the air, and the fragments are scattered around a large area,” Viktor Sorochenko, director of Russia’s Interstate Aviation Committee, told journalists in Cairo after visiting the crash site. According to people with knowledge of the investigation, the remains of the plane’s tail section, which had been damaged in a 2001 accident, were found several miles away from the front fuselage and cockpit. In addition, the bodies of several victims were discovered a significant distance from the main debris field, said the people, who spoke on the condition of anonymity to discuss the inquiry. Such a wide distribution of debris is a classic indicator of the plane coming apart while still in the air, according to Alain Bouillard, a former chief investigator for France’s Bureau of Investigations and Analyses, or B.E.A. “Such a wide dispersal is very particular after an in-flight rupture.” But in-flight ruptures are also extremely rare for modern commercial jets, experts say. According to the Egyptian aviation authorities, air traffic controllers received no distress call. Mr. Bouillard said wide fluctuations in altitude were highly unusual, but difficult to interpret in the absence of further details from the plane’s flight data and cockpit voice recorders. The recorders, often referred to as “black boxes” were recovered from the crash scene on Saturday and investigators in Cairo were to begin analyzing their contents on Monday. Other experts raised the possibility of pilot error. While Airbus aircraft are equipped with sophisticated software designed to help keep the plane flying within safe parameters, pilots must still maintain close attention to factors like speed, air temperature and altitude. A plane that was fully loaded with passengers and fuel, ascending too rapidly through the warm desert air might have risked an aerodynamic stall, some analysts said. Depending on the speed of the descent, the aircraft might have been ripped apart as it tumbled toward the ground. Analysts also left open the possibility of sabotage or some other deliberate act — a scenario that gained currency just hours after the crash, when a Sinai militant group affiliated with the Islamic State claimed responsibility. While most analysts remain skeptical that Islamic State militants in the area possess missiles with sufficient range to strike aircraft flying at cruising altitudes, experts said they could not rule out the possibility of a more conventional form of terrorism. “Could it be that someone put a bomb in the hold?” said Mark Rosenker, a former chairman of the United States National Transportation Safety Board. “That is just one of the elements that needs to be looked at.” He and others said the Egyptian-led investigation team, which includes experts from France, Germany, Russia and Ireland, should be able to make that determination fairly quickly once the recorders were analyzed. The shock wave of an onboard explosion would normally be captured by the microphones of the cockpit voice recorders, they said, and any explosive residue could be easily recovered from the debris.